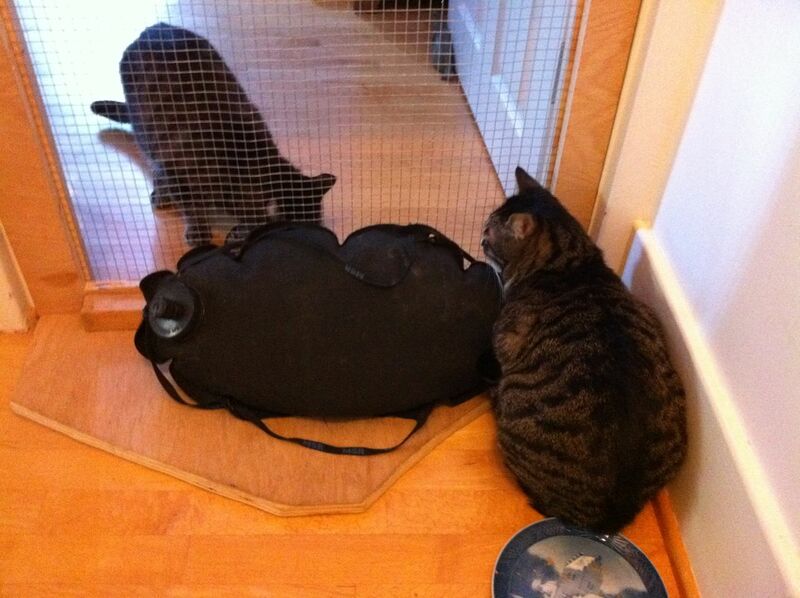 Because our cats have been fractious we have been keeping them isolated. 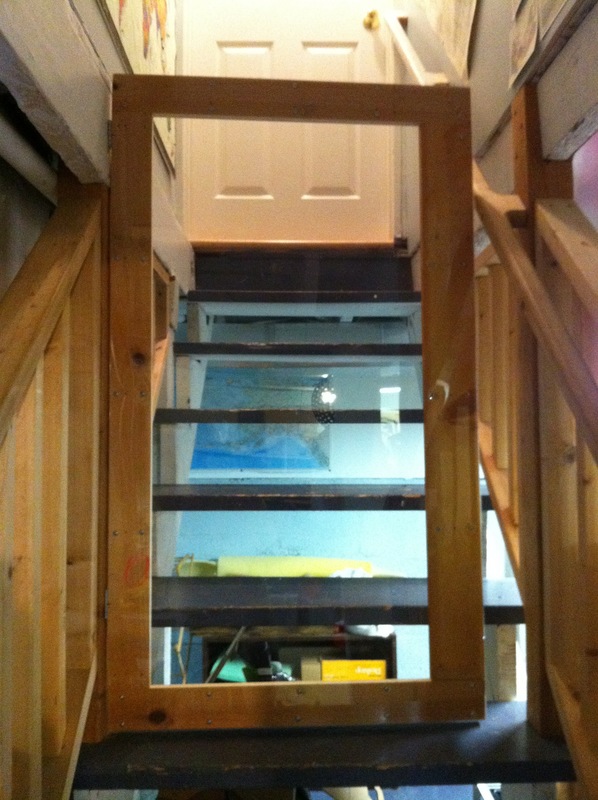 To make this easier we built a door for the top of the stairs to our second floor. The evening we put it up Luna jumped it. 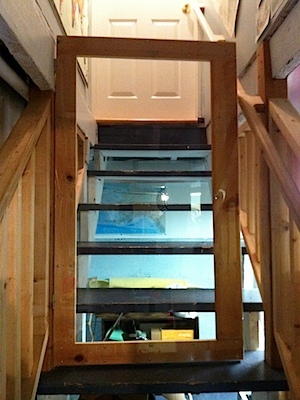 The door is about 5′ high from above and about 5’8″ from below (it is at a step) and there is little to grab onto. She probably stood on the bench to the left so it was not such a tall jump but the door is only 1/4″ thick so there is precious little for her to grab onto or stand on top of. Marie heard a kerfufel, a thump, and momentarily Luna came strolling into the room. I built this when we picked up Luna as a foster and wanted to introduce her to Nelson. It just slides into place and rests against the door frame. Originally it was about 5′ high and luna quickly learned to climb over that. 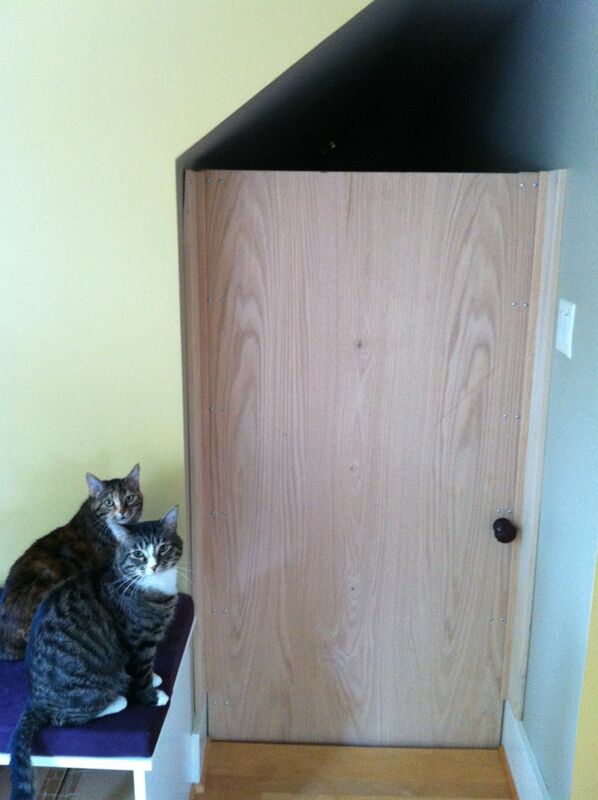 I extended it to 6′ with some wood that didn’t quite fit edge to edge and Luna learned to get around that. The final solution was to add some plexi-glass to over 6′, full width. The clear glass lets us see through. Meanwhile, the introduction barrier is set up at the door to Jojo’s room. Nelson seems to be upset when there are places he can not go and cats he can not, um, dominate? We are hoping that letting them watch each other will help them relax with each other. For now we are keeping foster cats in the basement, isolated from our residents. Problem is, once the fosters have explored the basement they are ready to see the rest of the house. Their presence at the door increased resident cat stress and makes it very difficult for us to get downstairs with out the fosters slipping upstairs. We still need to fill some holes around this door, but hope that it will keep the fosters away from the actual basement door and make it easier to have them in our house.